The IIoT [industrial Internet of Things] is poised to reshape factory automation, transportation, energy, and other industrial markets through the application of intelligence and connectivity, but the embedded systems that power these segments are still hampered by concerns about longevity, reliability, and low power consumption. Meanwhile, the use of higher-precision sensors, growing demand for video and graphics capability, and the desire for local analytics processing are driving an exponential demand for performance. 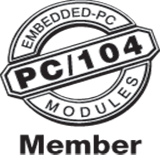 Since it was first introduced in 1992, the PC/104 form factor has enabled embedded computing for avionics, military command and control, industrial automation, medical systems, and more. Its small size and inherent ruggedization made it ideal for unique applications in the aerospace, industrial, medical, and military markets.